Democracy without a voice is no democracy at all. 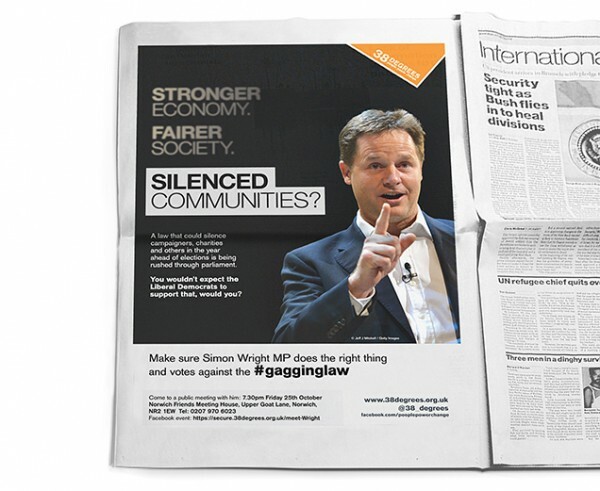 The lobbying bill (or ‘gagging law’) limits the activities of campaigning organisations for the year leading up to a general election by placing strict financial restrictions on any activity deemed to be political. The ramifications of the bill threaten freedom of speech and limit the opportunities for ordinary people to speak out on the issues that concern them. We worked with 38 Degrees, who were leading the fight against the bill, over a period of four months. Initially, our focus was on promoting awareness of the undemocratic nature of the bill, specifically with voters in marginal Liberal Democrat constituencies. As the bill moved through the Commons and on to the House of Lords, we looked to draw attention to a growing support that unified NGOs as disparate as the Countryside Alliance and League Against Cruel Sports. From the outset, we were always working to an incredibly tight timescale. It’s fair to say that there was a sense of urgency, of immediacy, about raising awareness around the bill – it was due to be raised in the House of Commons within days. 38 Degrees are an incredibly agile and responsive organisation. We had to be able to work at the same speed. Our campaign creative was circulated on a Friday afternoon via email and social channels and by the Monday morning, donations had come in from around 12,000 members of the public, raising in the region of £80,000. We created multiple artworks for a national press, six sheet and flyer campaign; supporting 15 local events in target constituencies. 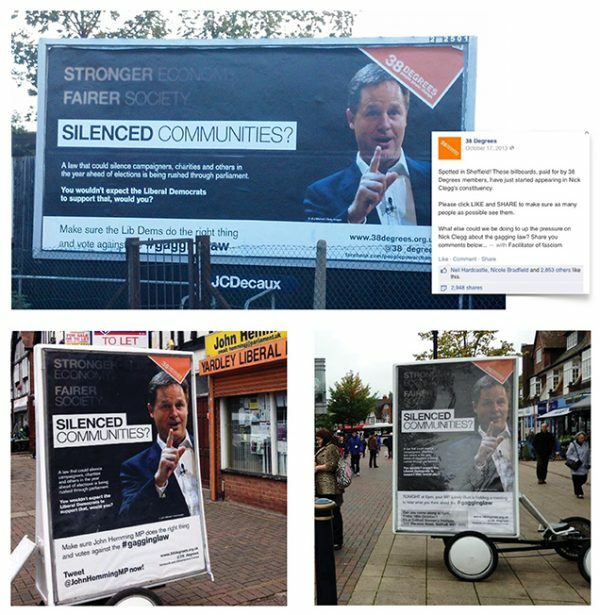 A 48 sheet poster was sited in Sheffield Hallam (Nick Clegg’s constituency). The bill was passed through the Commons and progressed to the House of Lords. The campaign required more than simply tailoring the existing message for a new audience. Our next stage of creative development centred on a completely new message that highlighted a growing surge of support across a diverse range of concerns and organisations. Advertising space was booked in all major broadsheets to have maximum impact on the day of the Lords’ debate and once again, we had to respond quickly. The challenge with working to a tight deadline is always maintaining quality and attention to detail, ensuring nothing slips. However, when building a new relationship with a client, you don’t have the option to rely on a tried and tested system of working – you can’t say, “It’s OK, we’ll sort that in artwork.” We were still in the early stages of building trust, rapport and working each other out. With a large-scale national media campaign scheduled, they were understandably nervous about getting the message spot-on, it had just one day to hit hard. After lengthy debate, the bill was sent back to the Commons for further discussion. The concerns of 38 Degrees and partner organisations had been duly noted amidst the political ping-pong. Changes were made and further amendments were finally put to vote in the Lords. 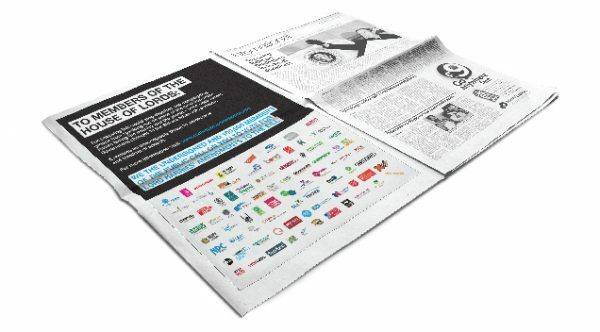 For one last push, we worked with 38 Degrees to demonstrate the breadth and depth of opposition to the bill, through a final broadsheet advertising campaign. It would be great to finish this story with a happily-ever-after, but unfortunately, the proposed amendments to the bill were overturned in the Lords by a single vote and the bill was passed (with some concessions). 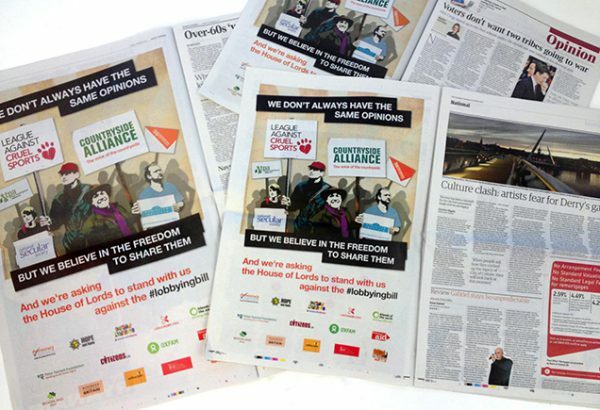 We’re proud to have been involved in this campaign and to play our part in speaking up against unjust and restrictive legislation.